A friend introduced me to this year's Goose Island at Thanksgiving. I enjoyed it and figured it would be a beer I could review that Mark could actually purchase and drink in Chicago for a change. 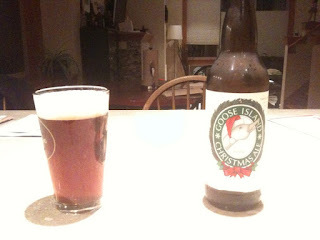 So here we are reviewing the Goose Island '09 Christmas Ale. It has a slightly hazy caramel color that is darker than an Amber but lighter than a brown ale. It is listed as a holiday brown ale but it's lighter in color than your typical brown ale. The brewer recommends it be aged up to 5 years so I suspect it will darken with age. It has a deep frothy head when you pour it with a slight off white creamy texture. The nose is light with a slight dough/yeast smell along with a light hop smell. The flavor is not as malty as you might expect. There is a good balance of bittering hops and the carbonation hits the center of your tongue in unison with the malt and hops. It's very pleasant beer that feels comfortable. Like that return home for the holidays where you recognize all those places and faces from your childhood, before you remember why you left. This is a good beer to settle in with and share with friends and family. It has a good balance that many can enjoy without offending your Mom or sending Grandpa on a rant about "what real beer in his day tasted like." All in all a great beer to celebrate the holiday with and if you're patient, to hold on to for next holiday. -A nice comfortable balance of malt, hops, and effervescent flavors. -A solid enjoyable beer but not a unique standout, Just like your coming home to your favorite pair of slippers.